Ladies from the Winona Lake, Ind., Grace Brethren Church helped Melissa Ngoumape, from the Central African Republic, celebrate her 12th birthday today. 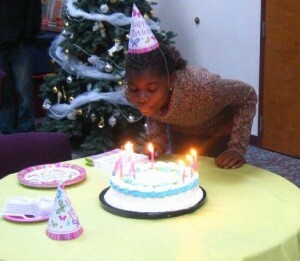 Melissa Ngoumape turned 12 today with a celebration at the Winona Lake, Ind., Grace Brethren Church. Some members of the Winona Lake (Ind.) 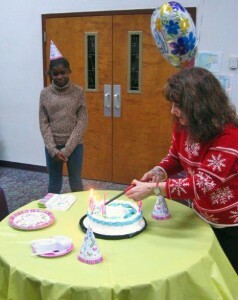 Women of Grace group from the Winona Lake, Ind., Grace Brethren Church (Bruce Barlow, pastor), along with church staff members, this morning celebrated today’s 12th birthday of Melissa Ngoumape, from the Central African Republic. 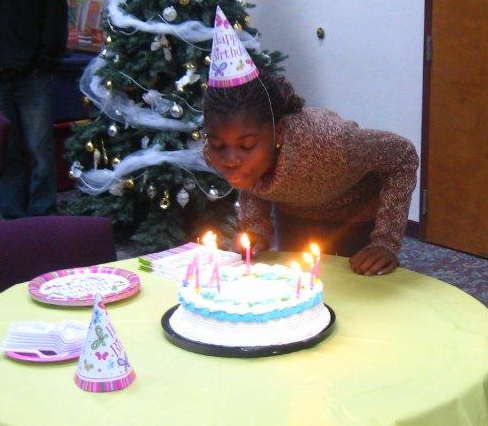 Melissa, along with her parents and sister, left the Central African Republic on December 23 and will be spending six months in Indiana as her father, Dr. Francois Ngoumape, serves as international scholar-in-residence at Grace Theological Seminary. Melissa and her sister will enroll in Jefferson Elementary School in Winona Lake, just across the street from the church, during their time in the U.S.